Zoë appears in the second series of this darkly comic drama about the cat-and-mouse game between an intelligence agent and notorious assassin. Episodes are currently airing on BBC America. Sky's epic drama about the Romans invading ancient Britain, starring Zoë as vengeful Queen Antedia, returns for a second series this autumn. Tweets by Zoë & her PA Vanesssa. This June will mark 100 years since the birth of Zoë’s father, Sam Wanamaker, the actor, director and founder of Shakespeare’s Globe. 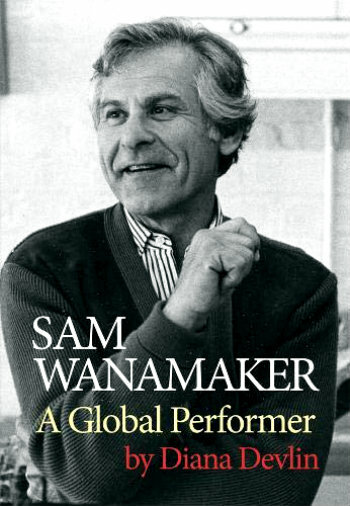 To celebrate the centenary, the first full-length, illustrated biography, Sam Wanamaker: A Global Performer, will be published by Oberon Books. The biographer is Dr Diana Devlin, a friend of Sam Wanamaker who worked alongside him for many years on the project to rebuild The Globe on London's vibrant South Bank. So we can be sure that the book will offer many valuable insights into its subject’s life and career. Sam Wanamaker is best known as the man who spent the last twenty five years of his life reconstructing Shakespeare's Globe near its original site just south of the Thames in London. Tragically, he died four years before its Gala Opening in 1997. Born in the USA, he began his acting career in travelling shows before moving on to Broadway. A vocal left wing activist, Wanamaker moved to the UK, fearful of being blacklisted during the McCarthy witch hunts of the early 1950s. Having crossed the Atlantic, he carved a successful and varied career as both actor and director, but continued to be outspoken on a variety of topics, including racial discrimination in the theatre. With his staunch sense of purpose, he made as many enemies as friends: charismatic and persuasive, he was also stubborn and domineering. But it was these very qualities that made his lasting legacy, Shakespeare's Globe, a reality, despite many battles. The hardback edition is available to pre-order now from Foyles bookshop and elsewhere. On 13 June, the eve of the centenary, Dr Devlin will explore Zoë’s dad’s achievements during the Sam Wanamaker Fellowship Lecture. The event will take place in the beautiful surroundings of the Sam Wanamaker Playhouse from 7:45 pm. Tickets are on sale now.